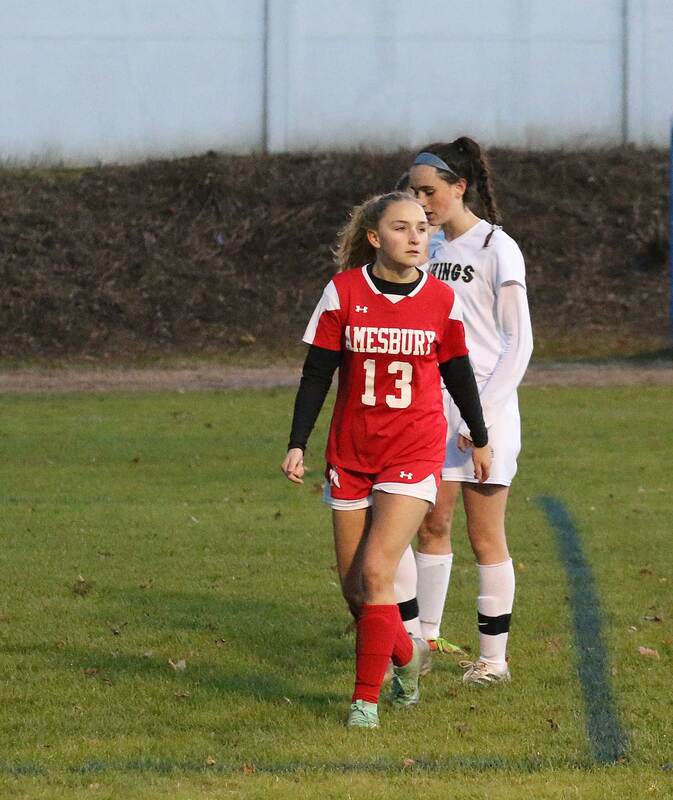 That was the assessment Winthrop girls soccer coach Tracey Martucci gave of Amesbury after her team was overwhelmed, 4-0, by the Indians on Sunday night in the D4 North First Round. The Indians were on the board (Sara Johnson) two minutes into the game and Chelsea Lynch added two more before halftime. 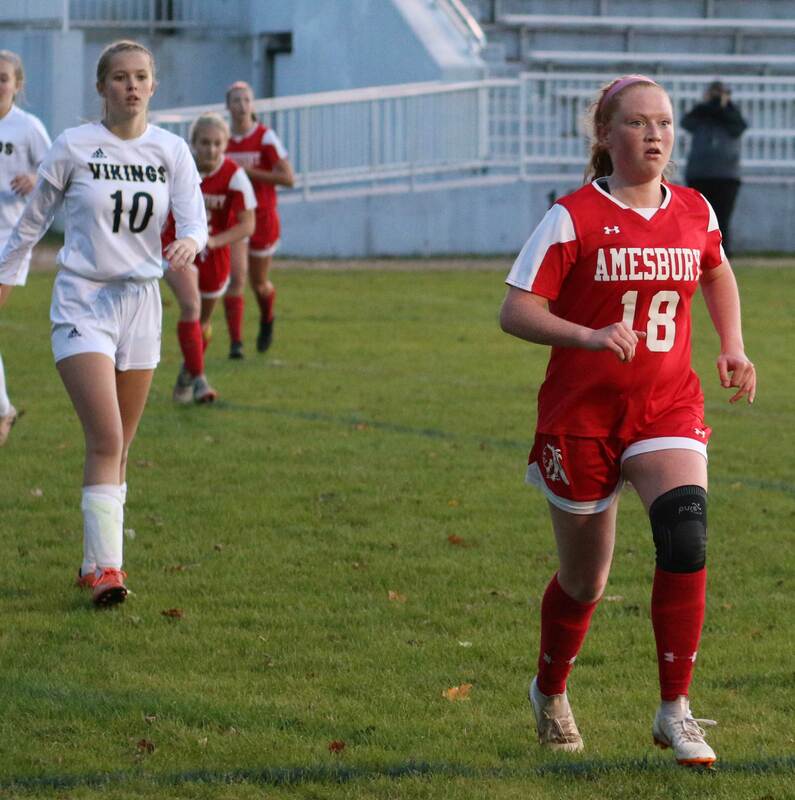 Avery Hallinan turned the 4th Amesbury goal seventeen minutes into the second half. 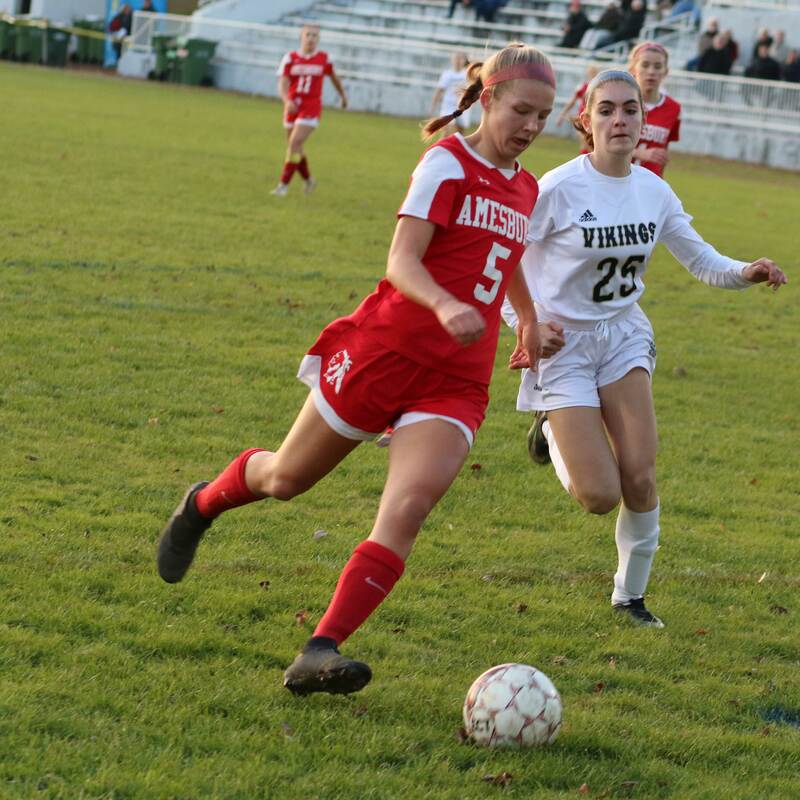 Amesbury (12-3-4) advances to the D4 North quarterfinals against Essex Tech on Tuesday night. 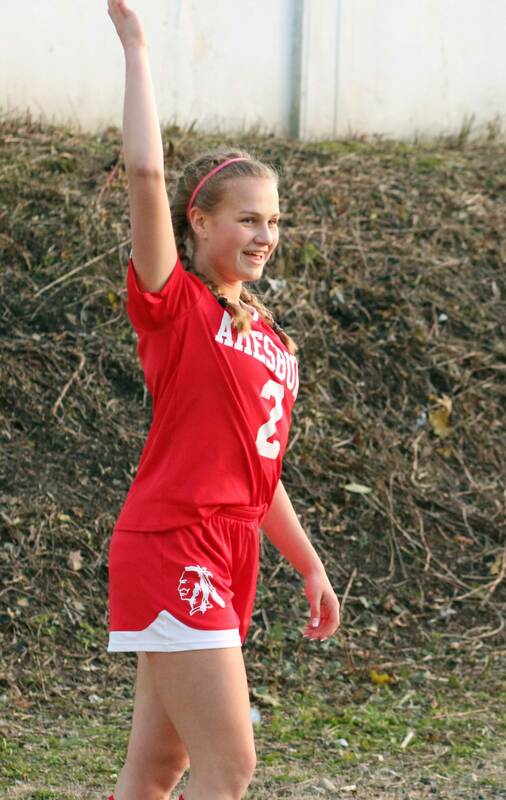 Maddy Creps had two assists. The #6 Indians are now undefeated in their last eight games. Last loss? Manchester-Essex at home on October 9th. I covered the 3-0 loss to the Hornets and was underwhelmed by what I saw of the Indians on that afternoon. Amesbury coach Adam Thibodeau wasn’t too thrilled either, as I recall. But today? The Indians were off and running against the #11 seed and really never gave the visitors from the Northeastern Conference a chance. “They were fast and aggressive,” said Coach Martucci. Coach Thibodeau’s only complaint after the game was that his team didn’t score more goals. 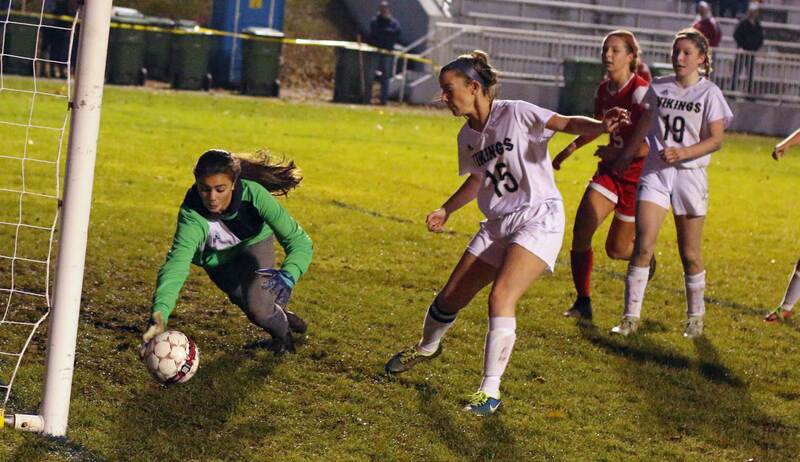 I spent most of the game near the Winthrop goal and believe me, goalkeeper Gemma Dimento was amazing under fire especially in the second half. 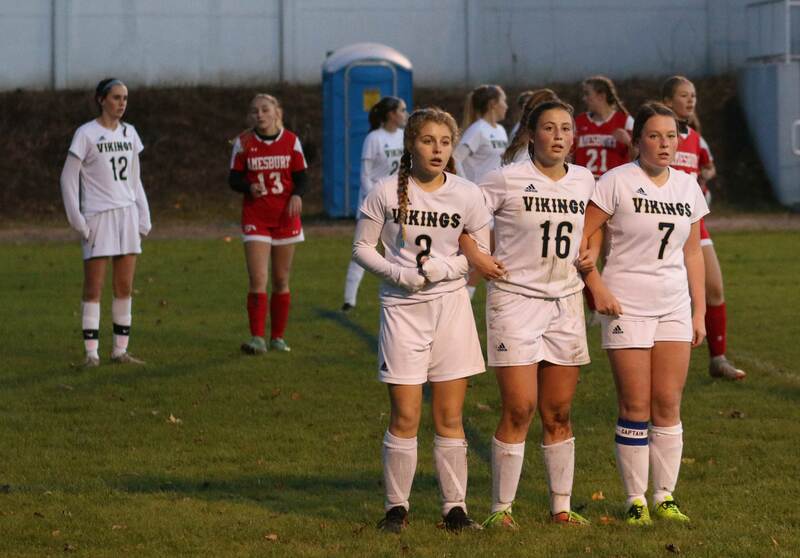 Miya Grein (2), Julia Macoccio (16), and Olivia Holmes (7) face a free kick. Two of the recent games I’ve covered have been scoreless until the final minutes. Amesbury would have none of that today. “We wanted to score early and get the momentum,” said senior Chelsea Lynch. And that they did. 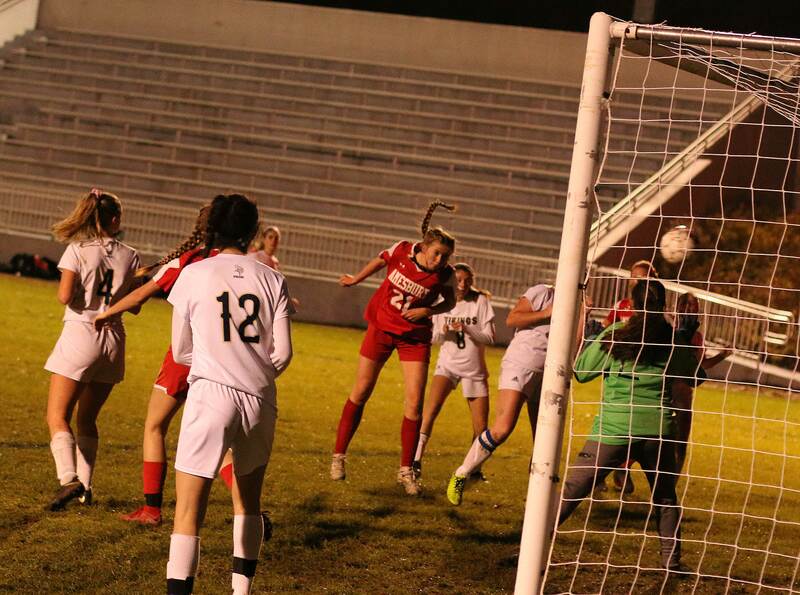 A Maddy Creps’ corner kick bounced back to senior Sara Johnson and she found a place in the net just below the crossbar. The game wasn’t even two minutes old. 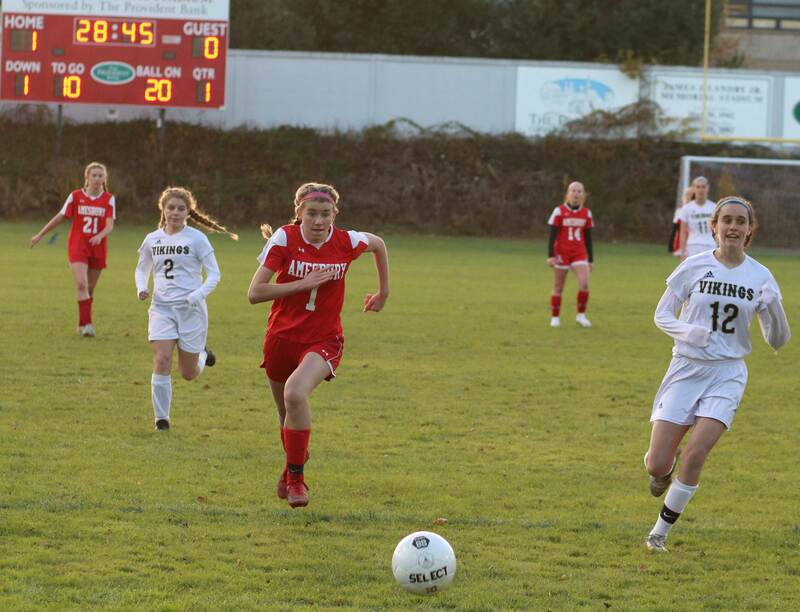 Led by sophomore Alyssa Pettet, the Indians kept the pressure on the Vikings defense. 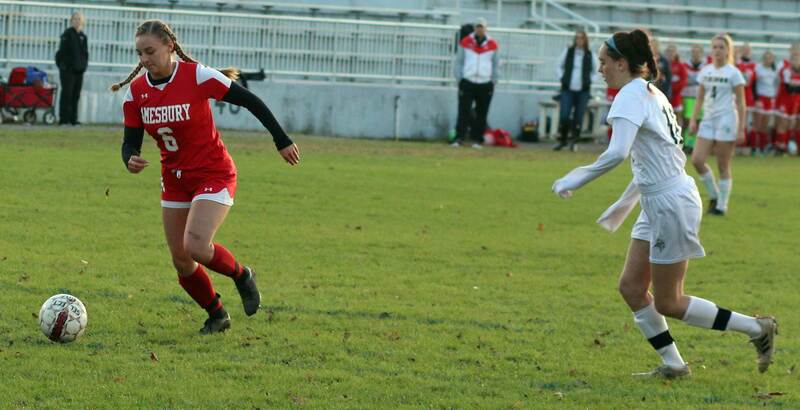 Alyssa was exceptional at controlling the middle of the field and creating offense for teammates or herself. 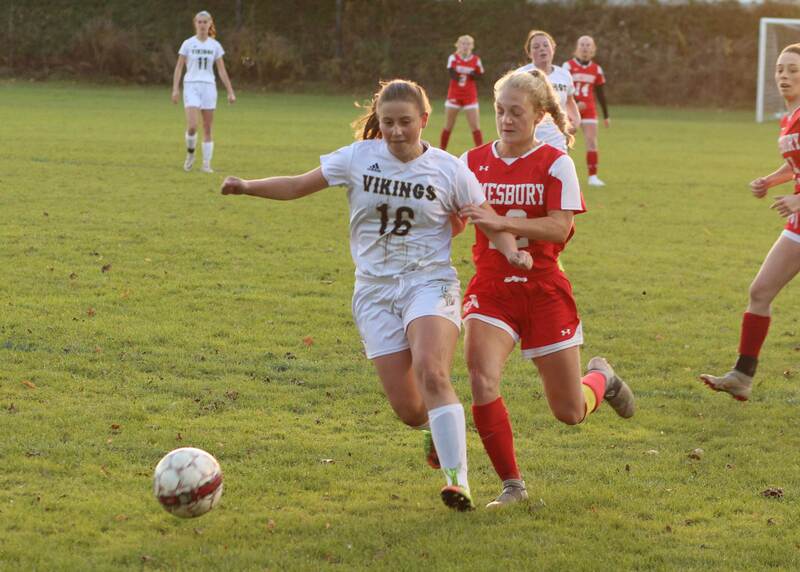 The biggest threat to score in this game was Amesbury’s speedy Chelsea Lynch. Twice she did score, and she also came close several other times. 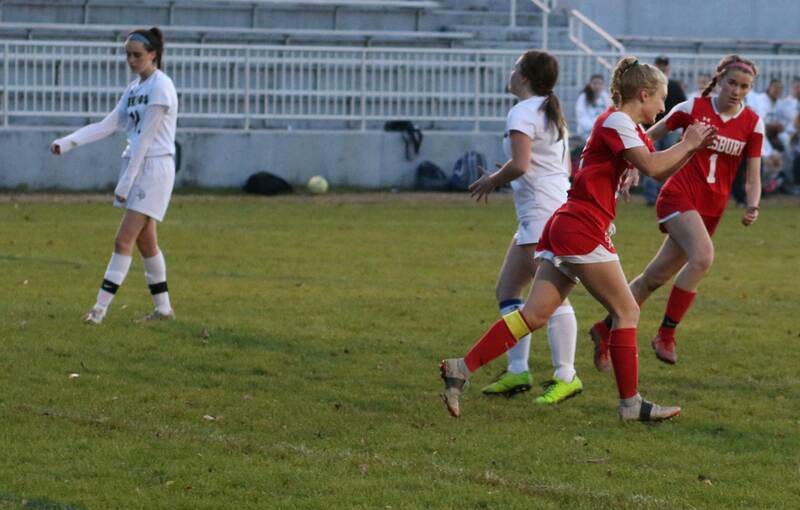 On Chelsea’s first goal, she came in on the left and caught the far corner. 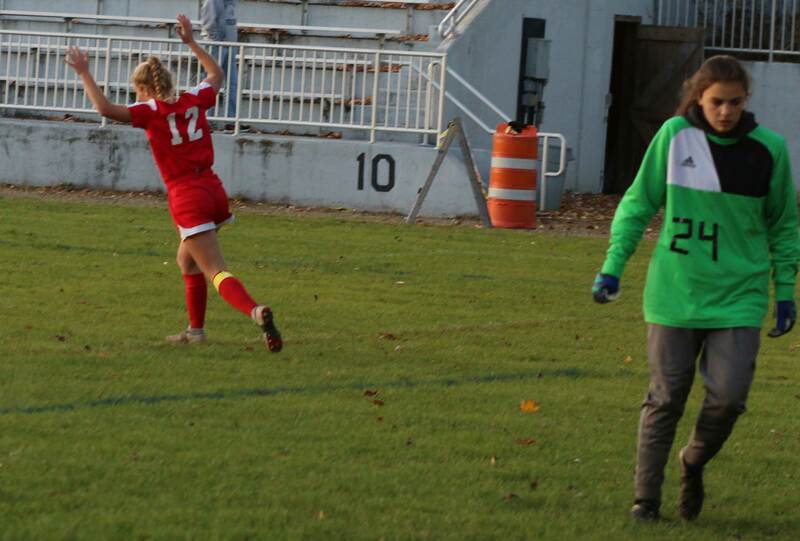 The second one was set up by a terrific pass from McKenna Hallinan. 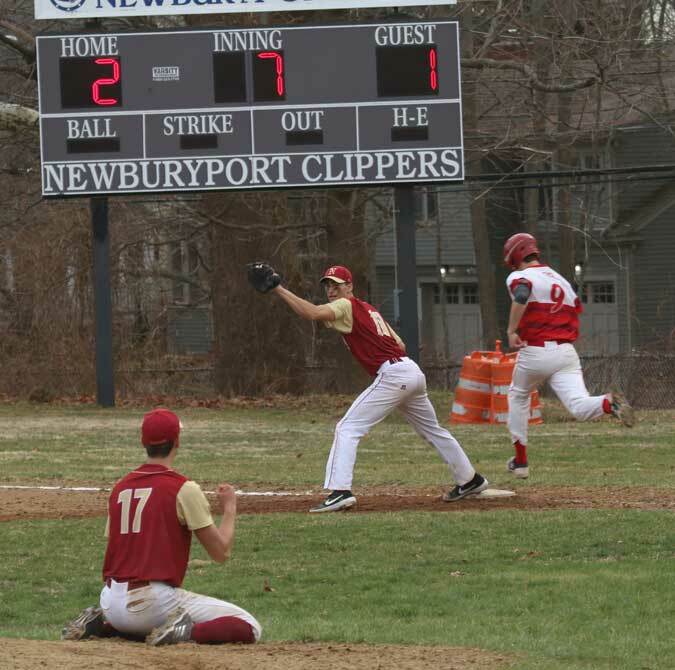 That support was evidenced often because Amesbury had layers of defenders in place to turn back Winthrop’s attempts to clear from their own end. Attempted clearouts were quickly turned into the next attack on the Winthrop goal. 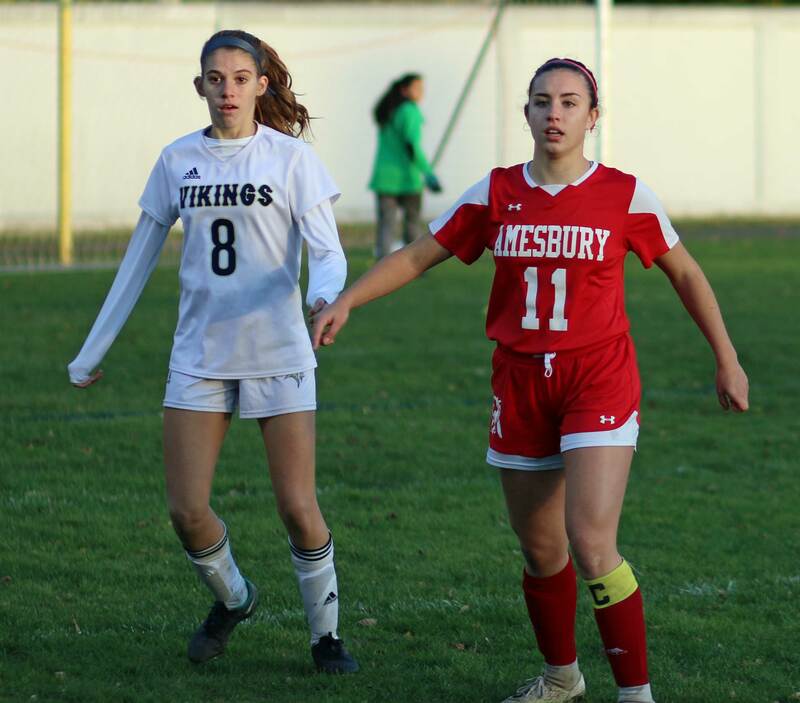 Vikings GK Gemma Dimento held off Amesbury in the second half until a Maddy Creps’ corner kick was redirected by teammate Avery Hallinan midway through that half. 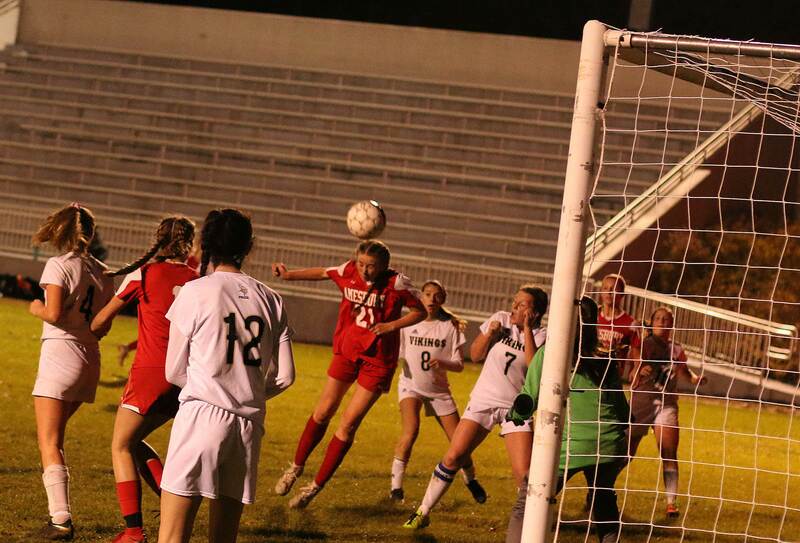 Avery Hallinan drives home a header. The #11 Vikings (Northeastern Conference) finish 10-8-1. Amesbury will need to win two more games to reach the D4 North finals. The opponent there might be Manchester-Essex. 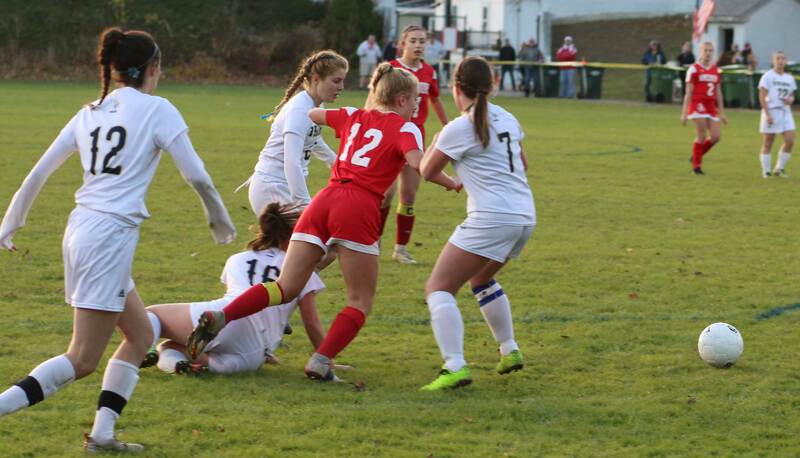 “We had a couple of low spots in the season,” said Alyssa Pettet regarding the 3-0 loss to Manchester-Essex. “We did beat them earlier in the season and we’d like to play them again.” We’ll see on that one. Reasonable temperatures (40’s) for a night in November. I was covering a game in a driving rainstorm yesterday in New Hampshire. Landry Stadium may be a nice place to play but taking pictures there at night requires equipment I’ll never be able to afford to own. Maybe time for a new bulb or two? But I whine!